The Oster Reverse Crush™ 300 Blender has a low profile design, making it easier to fit under cabinets on your countertop. The Oster Versa is our lowest priced blending machine that we have covered. The blender has 600 Watts of power. The Oster brand has a good reputation for quality machines at lower prices. This type of countertop blender can make smoothies, chop food, and make frozen drinks. Dual Direction Blade Technology™ Stainless steel, 6-point blade works with the motor to automatically kick in reverse and free jar jam-ups. The low profile 48 ounce jar is made of glass for blending a variety of ingredients. The lid has an opening with lid to add ingredients. A 2-ounce filler cap markings to measure and pour ingredients while blending. The all-metal drive provides durability and longevity. The Oster Reverse Crush blender has two Pre-programmed settings to automatically make smoothies/frozen drinks, and chop food. This model can also crush ice. 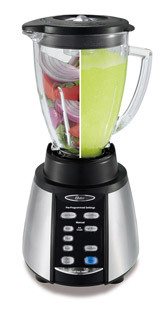 The blender also has low, med, high speeds, as well as low and high pulse. Oster is a trusted brand that goes back over 100 years. Smart-Review Commentary: The Oster brand has an excellent reputation with over 100 years of history. The Oster Reverse Crush 300 Counterforms Series blender maintains this tradition. This is an entry level blender with 600 watts of power, and an all metal drive. The blades will reverse to prevent jams. The Reverse Crush 300 also includes 2 Pre-programmed and timed settings for Smoothies & Frozen Beverages, and to chop food. It has a 48oz glass container for blending. The Reverse Crush model has received very good consumer reviews for a blender in its price range. This blender offers tremendous value, with many good basic features, and a 1-year limited warranty. The Oster Reverse Crush™ 300 is a Smart-Review top pick for Blenders under $100.